Clearly the positive price action in CBOT corn futures during the past couple of weeks has restored, at least, some of the lost hope of having a meaningful rebound to sell unsold inventory as well as a return to profitable price levels for next year’s crop. While it may be premature or even amiss to sound the “all-clear” signal, there have been several bullish developments worthy of discussion here. The weekly continuation chart, seen on the right, benefited greatly from the exit of the December contract and the establishments of March as the lead month contract despite the fact solid gains were already underway. In fact, the one month to another roll created a “gap up” on the charts. This gap may be filled in the next few weeks or it may remain open for an extended time and be a bearish target down the road. Importantly, several of my favorite technical indicators produced bullish buy signals; signals not seen since late summer of 2007. On the chart from page 1, these indicators are the Exponential Moving Average (EMA) which is depicted in Red and laid over the bar chart in the top pane, the MACD in the 2nd pane down, and the SSTO in the bottom pane. The bullish cross-overs are marked with green up arrows while the bearish cross-over is marked with a down arrow. Further legitimizing and enhancing the validity of each signal is the extreme level where the cross-over has occurred. This technical development will likely cause trend tracking traders, such as the funds, to switch gears. The speculative funds should now buy breaks as opposed to sell rallies. Take note how the market made quick advances last year also, just as soon as the indicators issued their change of trend notices. However, a set-back also ensued but the indicators never backed away from their bullish attitudes. Perhaps we will see a similar pattern unfold this year. After printing the lows of the year in April, the greenback spent most of the summer marking time, largely between .71 and .74. Then it hit. First the mortgage melt down, then the fall of Bear Stearns, and Lehman Brothers. Dead (or still dying) companies litter Wall Street like a war zone. Next came the de-leveraging of simple, moderate, and multi-faceted instruments (including grains) by small, moderate, and, of course, institutionalized conglomerates. The crisis created flight to safety US Dollar buying that was turbo-charged by even deeper financial concerns especially in Europe. Then, exacerbated by plentiful numbers of shorts now on the wrong side of the trade, the US dollar shot higher, and ultimately reached .88 – a level not achieved since April of 2006. Do you remember what prices were then? Subsequently, grain prices traded lower and lower as the dollar rallied and rallied. The chart above depicts the strong correlation of the US dollar to the price of corn. It is rather easy to see the inverse relationship. Looking back at the June/July summer highs, the dollar was positioning for the big move higher. Both markets achieved their respective extremes nearly on cue with each other. 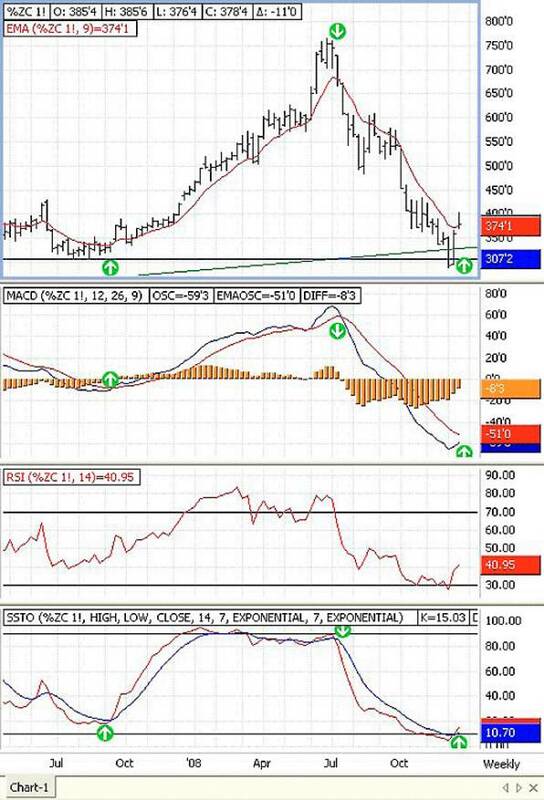 Never before do I remember a time when grain farmers have to be such informed currency traders like today. CORN: ARE THE RECENT PRICE GAINS A SELLING OPPORTUNITY OR THE START OF SOMETHING BIGGER? ● GASOLINE AT OR NEAR SEASONAL LOW, BUT WHAT ABOUT ETHANOL?